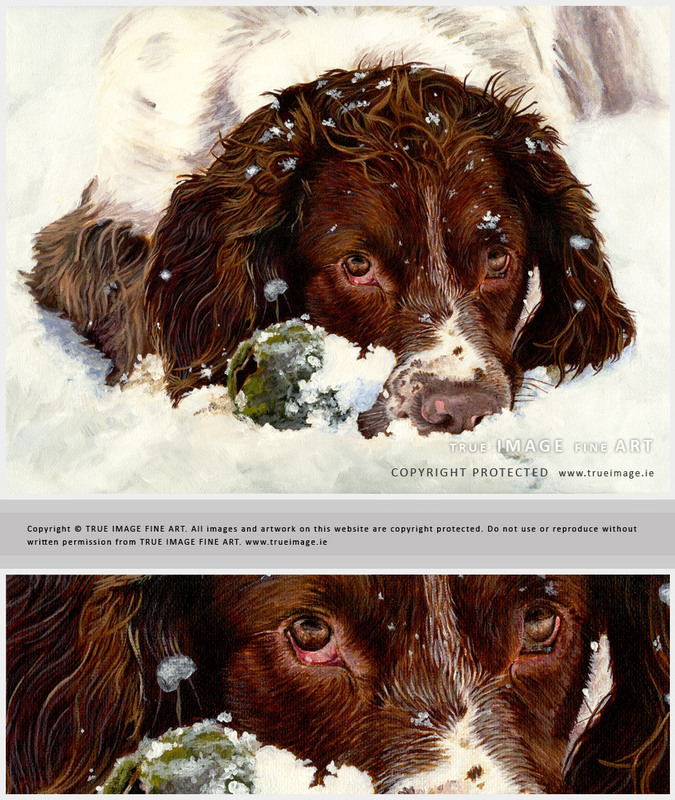 This pet portrait is of a very playful springer spaniel dog called Aidan. This photograph won the Drogheda Animal Rescue (DAR) pet photo competition back in 2011. It is a really clear shot showing Aidan in his best light. It really shows off his character and I wanted to achieve this in the pet portrait as well. I used a 20 x 30cm stetched primed canvas and many layers of acrylic paint. The paintings are really ready to hang as they are and I can provide a picture cord at the back if the client does not require framing. Below is a scan of the final pet painting with detail underneath. The detailed image shows the painting approximately in its actual size. I scan my work myself and match it to the original as much as I can for future printing if the client requires. Contact me for more information on commissioning a portrait of your own pet. 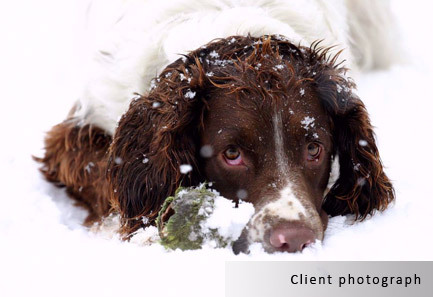 This is the winning photograph from the DAR pet photo competition. The winner got a painting of their pet as a reward for supporting an animal charity. Aidan's photograph was just so great, it had to win. There were no adjustments needed. The painting progress photographs are below and show Aidan's pet portrait developing on my easel. I used artist quality acrylic paints on stretched canvas and took photographs as I went along. If you have any comments or would like to keep informed about our work in progress, log on to the Art in Progress Blog. "I received the painting. It's absolutely fantastic! You really captured Aidan in the painting and I love it. Thanks so much."